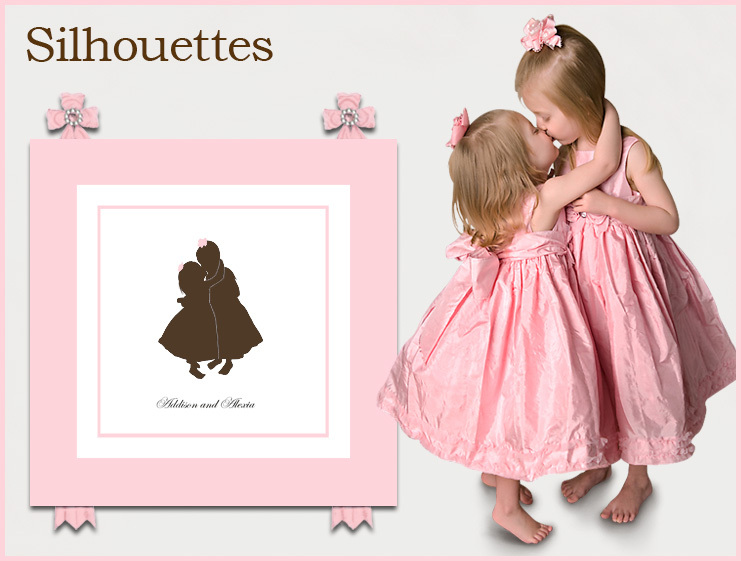 Hold on to a cherished moment in time with silhouette art from Dish and Spoon Productions. Our skilled artisans are known for capturing the profile likeness of children and families with remarkable detail, illustrating each piece with careful precision, intricate design, styling, and artistry that invokes an earlier time and place. Available exclusively through Dish and Spoon Productions, our designs are imaginative, engaging, and elegant - the perfect decorative accent for a child's nursery, bedroom, or play area. Each design may be ordered with personalization or a customer's choice of text. Choose a standard design, or have us create a custom silhouette for an extra special keepsake. Custom-made in the USA, Dish and Spoon Productions silhouette designs are available in multiple sizes and in two popular formats - museum-archival-quality canvas or lithorgraphic fine art prints. Our canvases are hand-stretched over sturdy two-inch deep wood stretcher bars with the art image wrapping around each of the sides. To preserve the integrity of the artwork for years to come, the surface of every canvas is glazed with a UV protective finish. Wall mounting hardware is included on the back of the canvas' stretcher bars to ensure level hanging. For a decadent look, the canvas may be ordered with our dreamy Dupioni silk ribbons. Fine art silhouette lithographs are printed with archival UltraChrome pigment inks on high-quality, acid-free paper to ensure your art retains all the color and detail of the original. Each print arrives unframed, wrapped individually in clear sleeves, and carefully packed flat in a sturdy cardboard box mailer or tube depeneding upon which is the best protection for the size.